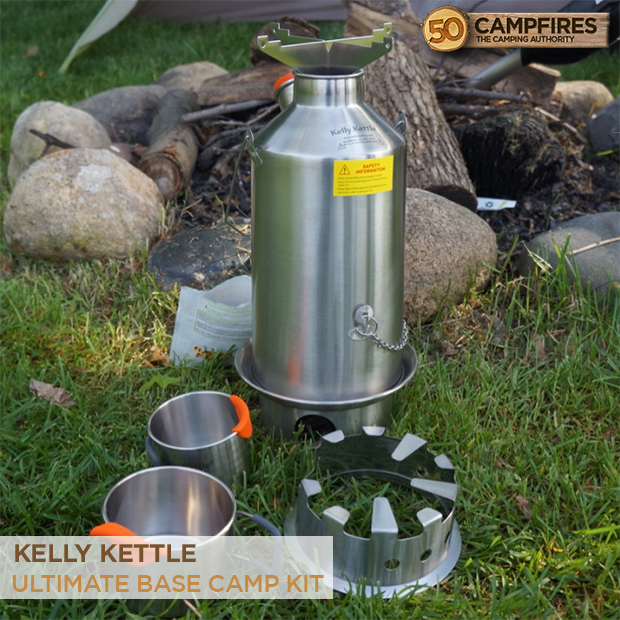 Summary : The Kelly Kettle Ultimate Base Camp Kit has everything you need to cook a quick meal or simply just boil water in minutes. Starting in the heart of Ireland, the Kelly Kettle has been around for over 100 years and for good reason. 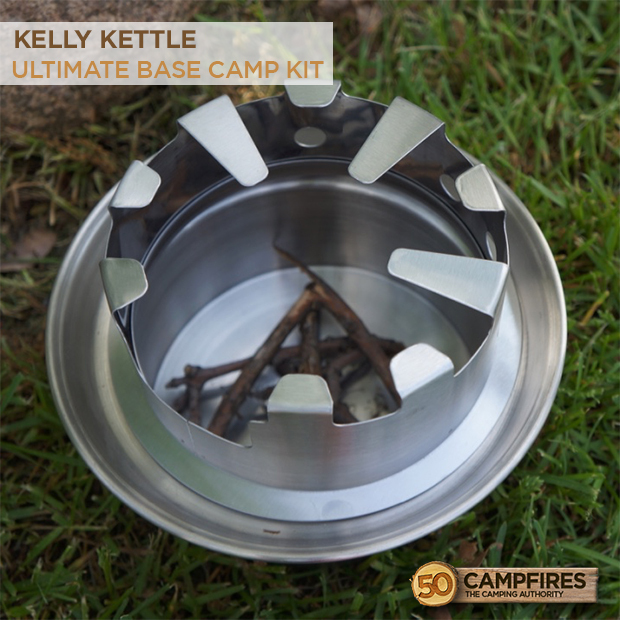 Perfect for car camping, scout events, and family picnics the Kelly Kettle boils water in minutes and only uses twigs for fuel. 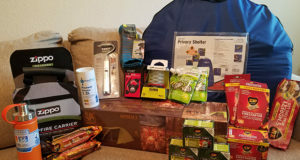 The Cooking Kit gets you set up proper with everything you would need to cook a small meal at the campsite. Appearance: The all stainless steel Kelly Kettle is robust with smooth edges, a great carry handle and a bright orange stopper that seals the water opening. The Kelly Kettle looks hollow with 2 openings at the top, but we promise it’s not completely hollow. The big opening is for air/steam to escape while the other opening is where the water goes in to a secret reservoir that holds 50 ounces or 6 cups of water. The Kelly Kettle sits atop a stainless steel bowl with a small hole on the side. This is where the magic happens. 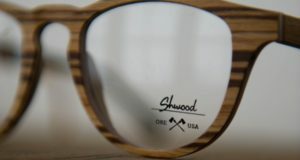 Just throw in some twigs, get a fire roaring and you’re off to the races. Along with the kettle comes to 2 stainless steel cups, a cookset pot, hobo stove, and pot support braces. Ease Of Use: Looking at all the bells and whistles that the Kelly Kettly Ultimate Base Camp Kit comes with, we thought it may be tough to operate. We were proved wrong. The Kelly Kettle itself is so easy to set up, with just 2 pieces, some twigs and water – you’re in business. The pot support braces fit snuggly in to the opening of the top hole and can hold a fairly good sized pot, like the cookset – that pot can hold up to 4 cups of water. The hobo stove is a great addition to the ultimate base camp as it allows you more options for cooking. The set really comes with everything you would need to create a meal at the campsite. Functionality: The Kelly Kettle really doesn’t require much skill to operate (even though the kit looks like a ton of parts). The base of the kettle sits on the ground and you put the kettle portion on top of that. Get a fire started in the lower base with a good amount of twigs. Pour water in to the reservoir that has the rubber stopper. Once that is filled, let the steam and magic of the kettle go to work. You can have boiling water in just a few minutes. You’re now able to use that to make a meal or create warm drinks – really whatever you want. 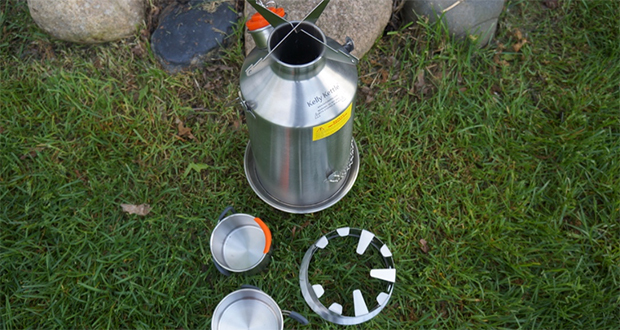 The hobo stove is one of the best additions to the ultimate base camp kit. It sits directly on the base so you’re cooking surface is very close to the heat source. It is also big enough to put a pan on and be able to fry up a meal. Weight: The Kelly Kettle itself comes in at 2.45 pounds while the accessories probably round it out at about 5 pounds. So for a cooking set up at the campsite, that’s nothing. 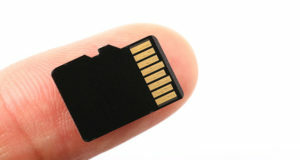 You could even walk in a little ways and camp with one of these. 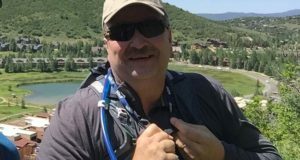 Although slightly bulky for truly backpacking, the kit is pretty light for all it contains. Value: The Cooking Kit comes in at right around $160. For all of the different elements and ways to cook a meal, that is a very fair price.